The current flagship for ARM's mobile graphics technology is undoubtedly the Galaxy S III, which contains a quad-core Mali 400 GPU and delivers some wild benchmark scores. By the end of this year though, we should see a whole new generation of Malis -- not just a Mali 450 for mid-range handsets, but also the quad-core T604 and the eight-core T658, which are based on ARM's Midgard architecture and are taking forever to come to market. Now, to whet our appetites even further, ARM has just added three more variants of the chip to its roster, which can almost be considered the next-next-generation: the quad-core T624, and the T628 and T678, which are both scalable up to eight cores. The trio's headline feature is that they promise to deliver at least 50 percent more performance with the same silicon area and power draw, with the explicit aim of delivering "console-class gaming," 4K and even 8K video workloads, as well as buttery 60fps user interfaces in phones, tablets and smart TVs. 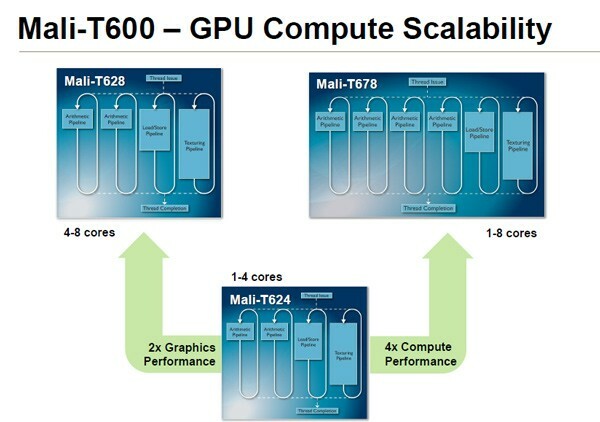 The premium T678 is aimed at tablets specifically, and in addition to allowing up to eight cores also doubles the number of math-crunching ALUs per core, which means that its compute performance (measured in gigaflops) is actually quadrupled compared to the T624. However, there's one other, subtler change which could turn out to be equally important -- read on for more. So, what is that secondary improvement? It's ARM's curious decision to dedicate a small section of silicon (two percent, in fact) solely to running a new graphical compression codec, which the company has designed in-house and handed over Khronos as an open standard. The codec -- called Adaptive Scalable Texture Compression (ASTC) -- is all about stopping the "fragmentation of standards" that game and app developers have to deal with. Currently, a developer has to choose different codecs to achieve different levels of texture compression for different platforms: for example, they might choose an 8-bit-per-pixel codec for desktop and then an entirely separate 4-bit-per-pixel codec for mobile. ASTC will put an end to all that, ARM claims, by supporting all manner of textures, color standards and bit-rates, and thereby becoming the "the new standard" which has "no competitors." This remains to be seen, of course, but somewhere on the outskirts of Cambridge, UK, and audible only to coders who know what an 8-bit HDR BPTC texture is, a gauntlet may have just hit the floor. LOS ANGELES, USA, SIGGRAPH 2012 – 6 AUGUST 2012 - ARM today announced the second generation of the ARM® Mali™-T600 Series graphics processing units (GPUs), providing a dramatically improved user experience for tablets, smartphones and smart-TVs. Each of the products features a 50% performance increase* and are the first to include Adaptive Scalable Texture Compression (ASTC), a texture compression technique that originated from ARM. ASTC significantly optimizes GPU performance and increases battery life in devices, enabling an always-on, always-connected experience, and has now been adopted by the Khronos™ Group, an important industry consortium that focuses on open standards. "The newly announced Mali-T600 series is essential for graphic performance improvement, and also for the future strategy of GPU Computing,"said Mr. Mitsugu Naito, Executive Vice President, IP and Technology Development Unit, Fujitsu Semiconductor Limited. "Through our Subscription License with ARM for ARM IP products, we are able to share our product roadmap and deliver ARM based platform SoC promptly to our customers. The new Mali-T600 series will be added to our SoC development platform portfolio and we plan to adopt the Mali-T600 series into our products as a key IP solution to enable improved GPU computing." "Increasingly, consumers are demanding similar performance across their connected devices to access their personal information and content. This improved user experience is demanded across a range of devices, including smartphones, tablets and smart-TVs," said Andrew Chang, Vice President, MediaTek. "MediaTek are working closely with ARM to ensure that we provide high-performance, energy-efficient solutions that address these demands. The second generation the ARM Mali-T600 GPU will allow us to address these markets through technology leadership in graphics and GPU compute." "Innovation happening in smart connected devices is not only in the computing area but also in the graphic area where smartphone and tablet manufacturers are seeking differentiation for their products. This relies on leading edge and innovative technologies from SOC vendors like Nufront," said Rock Yang, VP Marketing, Nufront. "Nufront is focusing on mobile computing and communication SoC design, leveraging advanced technologies from ARM. Using advanced technologies, such as Adaptive Scalable Texture Compression featured in the second generation of Mali-T600 GPUs, we can address the demands of the market and provide significant benefits to device manufacturers." "The performance and battery life requirements for smartphones, tablets, smart-TVs and other smart, connected devices are such that whilst a single energy-efficient architecture is suitable, GPU variants to address these markets are highly desirable," said Mr Chen Feng, Chief Marketing Officer, Rockchip. "We are please to extend our relationship with ARM and look forward to the advanced Rockchip solutions that will be enabled by the range of second generation Mali-T600 GPUs from ARM." "An advanced visual computing experience is an expectation that most consumers have when they purchase a new smartphone, tablet or smart-TV," said Taehoon Kim, Vice President of System LSI marketing team, Samsung Electronics' Device Solutions. "It is therefore important that Samsung works with partners, such as ARM, to achieve technology leadership in areas that include advanced graphics and GPU compute. The next generation of the ARM Mali-T600 series GPU is an important introduction, and will help Samsung Exynos processor to address consumer demands." *Each of the second generation Mali-T600 Series GPUs features a 50% performance increase compared to first generation Mali-T600 products (based on industry standard benchmarks) , on the same silicon process. This 50% increase has been facilitated by a combination of frequency improvements, such as optimizing the register transfer level (RTL) for increased performance, and micro-architectural improvements so that graphics are executed more efficiently.